The Behringer V-AMP 3 Guitar Effects Unit features up to 480 virtual combinations of amp models and acts as a USB audio interface for direct monitoring. There are 32 fully loaded amplifiers with 15 speaker cabinet models for an incredible variety of authentic sound to choose from. Additionally, the V-AMP 3 includes a multitude of digital effects such as reverb, chorus, flanger and many more. The guitar amp processors is ideal for studio and stage performances, making it ideal for every environment. 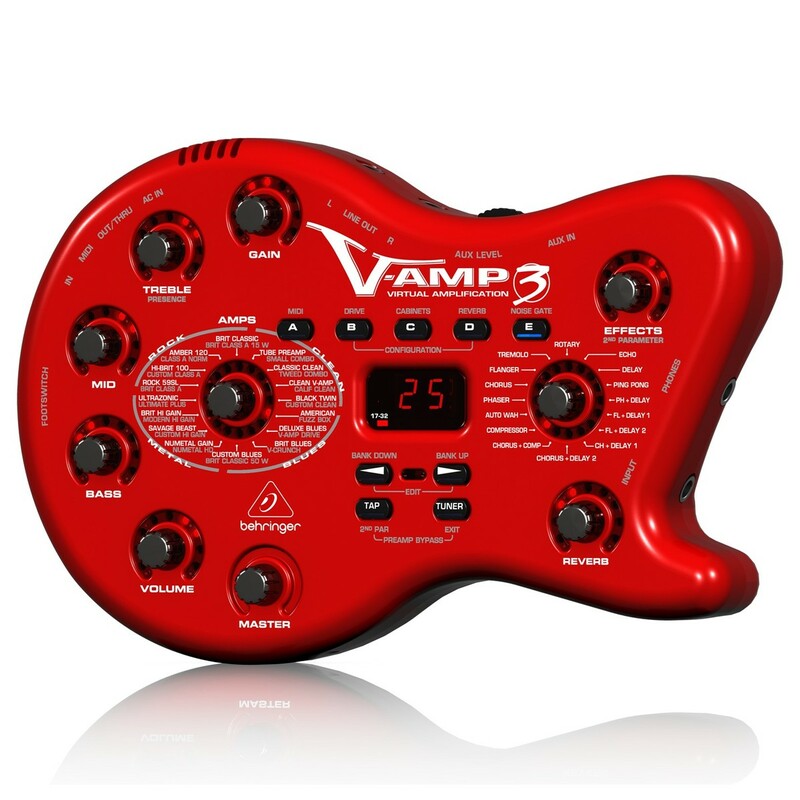 Split into four different groups, the V-AMP 3 delivers 32 amplifier models. These four groups include clean, blues, metal and rock. Once an amp model is selected, the amp will automatically select a speaker cabinet model for you. However should you want a different model, simply use the interface to navigate your way through the vast array of options. 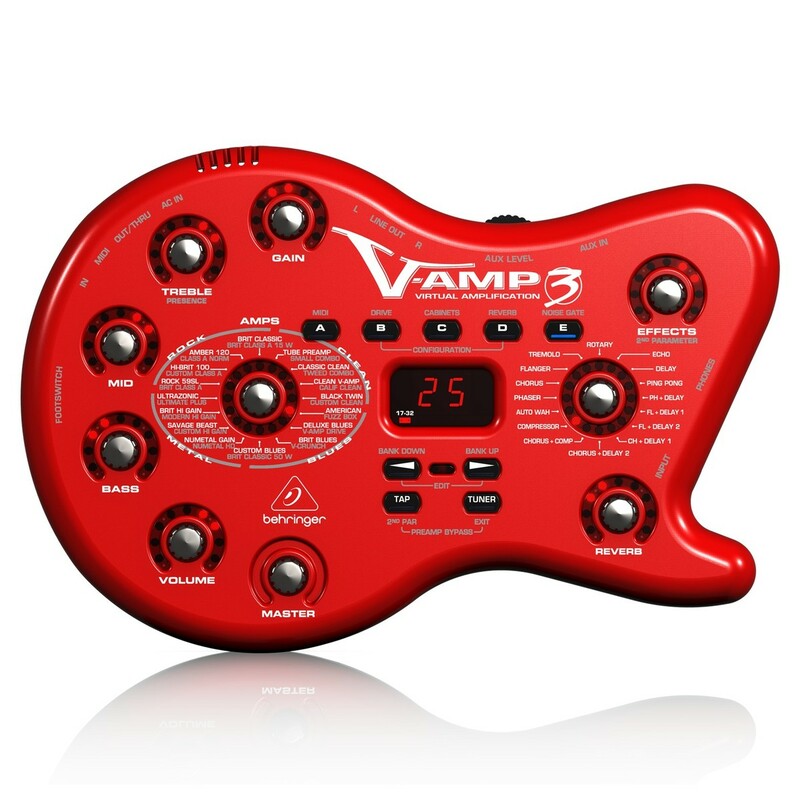 Like other instrument amps, the V-AMP 3 also offers guitarists a 3-band EQ as well as gain, volume and master volume dials. Combing these with the additional reverb processor, users can create their deal sound with no problem. With flanger, chorus, reverb, delay and 12 more digital effects, users can apply a number of different settings to their sound. To adjust the level in the mix, just turn the effects dial and set how much you want to apply to your tone. The V-AMP 3 guitar processor features 3 live configurations for an optimal on-stage performance. Live mode 1 is for running outputs directly into the mixer, live mode 2 lets you run the V-AMP 3 into the FX return inputs of 2 different amps. Live mode 2 is ideal for when you want the speakers sound to go unaltered. Finally, live mode 3 lets uers send the left output to an amp's FX return whilst the right output is fed to the main mixer.